Continuing in my vein of reading dog health books, I found a copy of the second edition (1992) of The Well Dog Book, by Terri McGinnis, DVM. It’s a bit old, but I reasoned that the field of caring for dogs hasn’t changed all that much. While the book is primarily about canine medicine and preventative care, I was utterly appalled at Dr. McGinnis’ recommended training techniques. Since the book was initially written in the 1980s, it is not surprising that she follows the now outdated dominance philosophy with regard to dog psychology. What was surprising to me is her strong statements that physical punishment is always necessary to establish “dominance” and “pack leadership.” The book even includes these horrible diagrams about how to push a dog’s head to the ground when it disobeys and how to pick you dog up by the scruff of its neck and give it a good shake. I was, clearly, mortified. After reading that chapter, I’ll admit that it was difficult to take the rest of the book seriously. I don’t doubt that Dr. McGinnis is probably a reliable veterinarian. I imagine I’ll be returning to this book if I have any basic medical questions about our future dog, but I certainly won’t be looking to it for any behavioral advice. Since I’m leaning more and more into the adoption camp, I thought it would be a good idea to read a book specifically about adopting a dog. One of my primary hesitations about adopting a dog from the shelter is handling the behavioral baggage that these abandoned dogs may come with. I picked up Adopting a Dog from the library and looked forward to learning more. The beginning of book provides some helpful insight on choosing a dog and bringing it home from the shelter or rescue agency. For instance, Ross and McKinney point out basic facts, such as that it’s probably unwise to choose the dog who cowers at the back of his kennel when you approach. Even though your heart may be moved by his fearful display, this will be a dog who will–most likely–be extremely difficult to train. Ross seems to have written most of the training chapters and I wasn’t hugely impressed by his methods. I’ve been completely sold on positive training methods since the first serious dog book I read and so I get suspicious when people like Ross criticize positive training as being unable to produce results and insisting that dogs need physical discipline. Ross commonly recommends physical corrections like leash pops and forcing a dog into positions (like sitting, down, etc.). Suffice it to say, I wasn’t very impressed with his training regimen. Unlike positive trainers like Pat Miller and Patricia McConnell, who are actually certified in their fields, Ross does not appear to have any serious credentials–aside from the fact that he’s owned a lot of dogs. This is certainly more than I have, but I’m not inclined to take his advice too seriously–especially when he maligns positive training methods and encourages physical punishment. Overall, I was disappointed by this book and was hoping that it would provide some more useful information about issues like house training an adult dog, working through separation anxiety, and discerning a dog’s behavioral background. 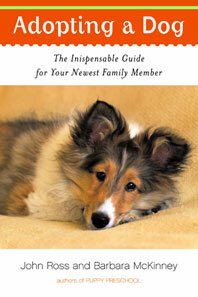 Have you read a good book on dog adoption? If so, please share! I’m still eager to learn more.